Objectives The level of vitamin D is considered to be associated with the development and progression of heart failure (HF). However, it is still unclear whether supplementation of vitamin D could improve ventricular remodelling in patients with HF. This study aimed to systematically evaluate the influence and safety of additional vitamin D supplementation on ventricular remodelling in patients with HF. Design This study is a meta-analysis of randomised controlled trials (RCTs). Setting The PubMed, EMBASE, CNKI, Cochrane library, Web of Science databases and grey literature were searched for RCTs regarding the effect of vitamin D on ventricular remodelling in patients with HF (from database creation to October 2017). RevMan V.5.3 software was employed for data analysis. Participants Seven RCTs with a total of 465 patients, including 235 cases in the vitamin D group and 230 cases in the control group, were included. Primary and secondary outcome measures Left ventricular end-diastolic dimension (LVEDD), left ventricular ejection fraction (LVEF) and the incidence of adverse reactions. Results Compared with the control group, a decrease in the LVEDD (mean difference (MD)=−2.31 mm, 95% CI −4.15 to −0.47, p=0.01) and an increase in the LVEF (MD=4.18%, 95% CI 0.36 to 7.99, p=0.03) were observed in the vitamin D group. Subgroup analysis also revealed a reduced LVEDD in adults (>18 years) and adolescents (<18 years) of the vitamin D group relative to that in those of the control group. High-dose vitamin D (>4000 IU/day) was more effective at reducing the LVEDD than low-dose vitamin D (<4000 IU/day). Moreover, vitamin D supplementation was more effective at reducing the LVEDD and increasing the LVEF in patients with reduced ejection fraction than in patients without reduced ejection fraction. Conclusion Vitamin D supplementation inhibits ventricular remodelling and improves cardiac function in patients with HF. The results of this systematic review and meta-analysis are highly dependent on the quality of the included primary research studies, and only randomised controlled trials were included in this study. Subgroup analyses were performed according to clinical heterogeneity analysis of the included studies. This was the first review to systematically examine the impact of vitamin D supplementation on ventricular remodelling in patients with heart failure. The results suggest that vitamin D may be used as adjunctive heart failure medication in heart failure patients with an underlying lack of or insufficiency in vitamin D.
The results need to be interpreted with caution as there were few studies in each subgroup. Heart failure (HF) is the main factor leading to economic loss due to poor prognosis and a high mortality rate.1 In the USA, there are at least 5 000 000 patients with decreased contractile function; meanwhile, there is also the same number of patients with the same disease in Western Europe.2 3 In recent years, the prognosis of HF has improved remarkably, and the 5-year survival rate has increased from 43% to 52%.4 At present, the main treatment methods for HF are still β-receptor blocking agents, ACEI/angiotensin receptor blocker and aldosterone receptor antagonists; although these medications can reduce the incidence of adverse cardiac events and improve cardiac function,5 HF is still a main cause of global mortality. Therefore, there is presently an urgent need for supplementary treatment methods and strategies. Lack of or insufficiency in vitamin D may result in cardiovascular and cerebrovascular diseases.6–10 Many studies have discovered that11–14 there is a remarkable association between lack of vitamin D and the progression of HF. Studies have shown that patients with HF generally lack vitamin D and have a poor prognosis; moreover, supplementation of vitamin D could reduce the mortality rate of patients with HF.15–17 Several studies have shown that vitamin D acts as a negative regulator of the renin–angiotensin–aldosterone system (RAAS)18–20 and modulates myocardial extracellular matrix turnover. Consistently, vitamin D receptor (VDR) knockout mice show increased RAAS activity, which leads to hypertension, cardiac hypertrophy, increased water intake and sodium retention,18 and VDR knockout mice show increased metalloprotease activity, which promotes the destruction of myocardial tissue, leading to ventricular remodelling.21 22 Therefore, lack of vitamin D could result in deterioration of heart function and accelerate myocardial remodelling. At present, different studies have reported controversial conclusions regarding the influence of vitamin D on ventricular remodelling in patients with HF. Therefore, the present study performed a meta-analysis to further clarify the influence of vitamin D on ventricular remodelling in patients with HF. PubMed, EMBASE, Cochrane Central Register of Controlled Trials, CNKI and Web of Science were searched. Grey literature was also retrieved in Opengrey and ProQuest. The reference lists of identified articles and the bibliographies of original articles were also reviewed. The medical subject headings used in the search were as follows: “heart failure”, “vitamin D”, “ventricular remodelling”, “heart function tests” and “randomized controlled trials”. The keywords used in the search were as follows: “cardiac failure”, “myocardial failure”, “heart decompensation”, “left ventricular remodelling”, “ventricular remodelling”, “ventricular myocardial remodelling”, “cholecalciferol”, “vitamin D3” and “controlled clinical trials”. The time frame for the retrieval was from the establishment of the database to 1 October 2017. The inclusion criteria were as follows: (1) randomised controlled trials (RCTs) involving the effect of vitamin D on ventricular remodelling in patients with HF with or without blinding methods or allocation concealment methods; (2) parallel or crossover trials; (3) only the data before the washout period were used in a crossover test; (4) available baseline data and changes in the left ventricular end-diastolic dimension (LVEDD) and left ventricular ejection fraction (LVEF); (5) HF defined as New York Heart Association (NYHA) functional class ≥II or LVEF ≤40%; (6) participants of any gender, age or ethnicity; (7) participants without or changing any micronutrient use except for vitamin D and (8) a minimum of 3 months of therapy was necessary for inclusion in the review to ensure that the intervention had sufficient time to produce a better effect. The exclusion criteria were as follows: (1) only the abstract was reported for reference; (2) studies with duplicated data, including the same group of patients or patients for whom there were updated results available; (3) the study had no outcomes of interest; (4) animal studies and reviews; (5) conference documents and (6) non-RCTs, cohort studiers and retrospective studies. The primary endpoint was LVEDD, and the secondary endpoints were LVEF and the incidence of adverse reactions. A total of 157 published papers were collected after the initial screening, and eventually, 7 RCTs26–32 with a total of 465 patients, including 235 cases in the vitamin D group and 230 cases in the control group, were included after reviewing the title, abstract and full text, as well as eliminating duplicate documents, non-RCTs and studies that failed to meet the inclusion criteria. See figure 1 for the screening process. 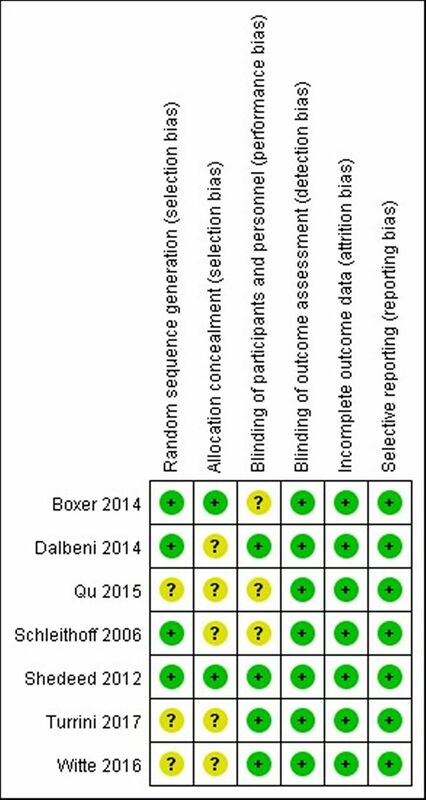 In the seven included studies,26–32 four reported an appropriate randomisation method27–29 32; two adopted allocation concealment29 32 and six used double-blinding.26–30 32 See figure 2 for the evaluation of the methodology of the studies. Data of the curative effect on the LVEDD were reported in five studies, and the LVEF was reported in all the included studies; two studies mentioned adverse reactions.26 30 Dropout or withdrawal from the research study was covered in all the included studies. The study characteristics are shown in table 1, and the basic information of the included population is shown in table 2. Changes in the LVEDD of patients were reported in five studies,26–30 which showed high levels of heterogeneity among the results of the studies (heterogeneity χ2, p=0.07, I2=55%), thus supporting analysis using the random-effects model. Compared with the control group, a decrease in the LVEDD was observed in the vitamin D group (MD=−2.31 mm, 95% CI −4.15 to −0.47, p=0.01) (figure 3). 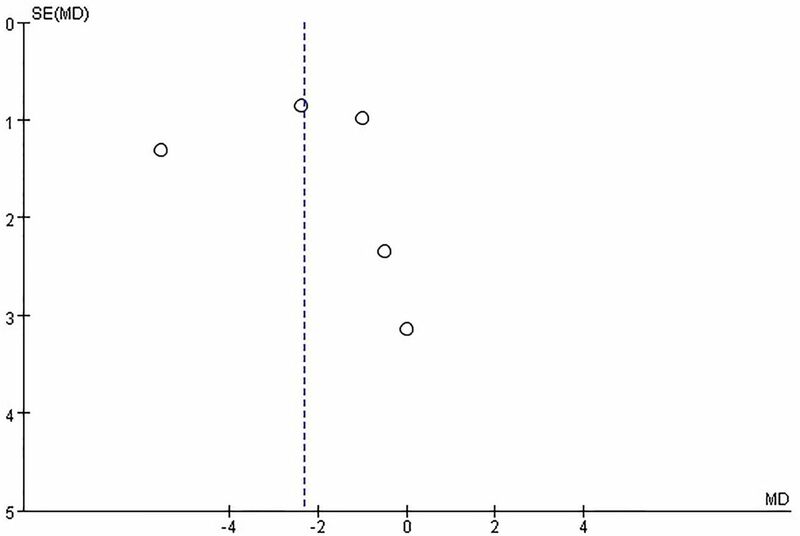 Forest plot showing the effect of vitamin D on left ventricular end-diastolic dimension. Changes in the LVEF of patients were reported in all seven studies,26–32 which showed high levels of heterogeneity among the results of the studies (heterogeneity χ2, p<0.001, I2=88%), thus supporting analysis using the random-effects model. Compared with the control group, an increase in the LVEF was observed in the vitamin D group (MD=4.18%, 95% CI 0.36 to 7.99, p=0.03) (figure 4). Forest plot showing the effect of vitamin D on left ventricular ejection fraction. The analysis based on age stratification revealed that compared with the control group both the adults (aged ≥18 years) and non-adults (aged <18 years) with HF in the vitamin D group showed a decrease in the LVEDD (adults: heterogeneity χ2, p=0.65, I2=0%；MD=−1.62 mm, 95% CI −2.83 to −0.42, p=0.008; non-adults: MD=−5.51 mm, 95% CI −8.08 to −2.94, p<0.001) (figure 5). These results, however, need to be interpreted with caution as there was only one study in the subgroup of non-adults. Subgroup analysis of effect of vitamin D on left ventricular end-diastolic dimension according to patients’ age. A subgroup analysis was performed according to the dosage of vitamin D. There was an effect from high-dose vitamin D on the reduction of the LVEDD (heterogeneity χ2, p=0.50, I2=0%; MD=−1.71 mm, 95% CI −2.95 to −0.46, p=0.007), but this effect was not seen with low-dose vitamin D treatment (heterogeneity χ2, p=0.06, I2=71%; MD=−3.38 mm, 95% CI −8.23 to 1.48, p=0.17). (figure 6). Subgroup analysis of effect of vitamin D on left ventricular end-diastolic dimension (LVEDD) according to dose of vitamin D.
According to patients with or without reduced ejection fraction, subgroup analyses were performed. Vitamin D supplementation was effective at reducing the LVEDD in patients with reduced ejection fraction (patients with reduced ejection fraction: heterogeneity χ2, p=0.07, I2=62%；MD=−3.11 mm, 95% CI −5.67 to −0.55, p=0.02; patients without reduced ejection fraction: heterogeneity χ2, p=0.76, I2=0%；MD=−0.91 mm, 95% CI −2.76 to 0.94, p=0.34) (figure 7). In addition, vitamin D supplementation was effective at increasing the LVEF in patients with reduced ejection fraction (patients with reduced ejection fraction: heterogeneity χ2, p=0.02, I2=73%; MD=6.21%, 95% CI 2.01 to 10.41, p=0.004; patients without reduced ejection fraction: heterogeneity χ2, p=0.002, I2=80%; MD=2.74%, 95% CI −1.96 to 7.45, p=0.25) (figure 8). Subgroup analysis of effect of vitamin D on left ventricular end-diastolic dimension according to patients with or without reduced ejection fraction. Subgroup analysis of effect of vitamin D on left ventricular ejection fraction according to patients with or without reduced ejection fraction. 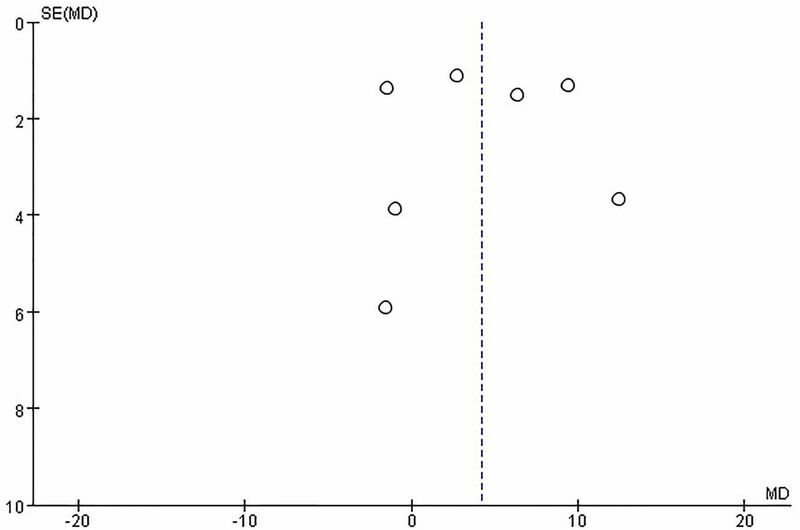 There was significant asymmetry in the funnel plot for the effect of vitamin D on the LVEDD, which may be due to publication bias and other causes (figure 9). On the other hand, no publication bias was found for the effect of vitamin D on the LVEF (figure 10). Funnel plots for the effect of vitamin D on left ventricular end-diastolic dimension. Funnel plots for the effect of vitamin D on left ventricular ejection fraction. Two studies26 30 reported adverse events. During the follow-up, no significant adverse event was recorded. No data associated with the incidence of adverse events were recorded in the other studies. At present, different studies have reported controversial conclusions regarding the influence of vitamin D on ventricular remodelling in patients with HF. The results of this study show that compared with the control group supplementation of vitamin D could reduce the LVEDD (MD=−2.31 mm, 95% CI −4.15 to −0.47, p=0.01) and improve the LVEF (MD=4.18%, 95% CI 0.36 to 7.99, p=0.03) among patients with HF. In addition, a more pronounced effect is achieved using high-dose vitamin D and on patients with a reduced ejection fraction. Most new treatment methods for chronic HF are expensive and require advanced technologies33; in addition, most of these treatment methods have not passed strict phase III clinical trials. For patients with HF, vitamin D is not only cheap but also safe, and these patients may obtain more benefits from vitamin D therapy.34 Vitamin D toxicity is based not only on the dosing but also on circulating 25-hydroxyvitamin D (25(OH)D) levels. The Institute of Medicine35 has set the dosage for vitamin D at 4000 IU daily for healthy adults, and the Endocrine Society15 has set a dosage of 10 000 IU daily for patients who are at risk of having circulating 25(OH)D levels<50 nmol/L. The Institute of Medicine35 considers circulating 25(OH)D levels below 30 nmol/L as deficient, levels between 30 and 49.99 nmol/L as inadequate, levels between 50 and 125 nmol/L as adequate and levels above 125 nmol/L as potentially harmful. In HF, cardiac contraction and diastole are affected due to overload of Ca2+ ions in myocardial cells. Lack of vitamin D may intervene with the functions of Ca2+ in myocardial cells, thus resulting in cardiomyocyte hypertrophy and intra-organisational inflammatory reaction and fibrosis.36 37 Low vitamin D levels can activate the renin–angiotensin system,38 give rise to inflammatory reactions39 and result in endothelial dysfunction.40 The effects of vitamin D on the CV system are additionally mediated through elevated parathyroid hormone (PTH) levels, which are associated with the development of left ventricular (LV) hypertrophy.41 Although there is much evidence showing that a lack of vitamin D could result in poor prognosis among patients with HF, different studies have reported controversial conclusions regarding whether supplementation of vitamin D could benefit patients with HF. 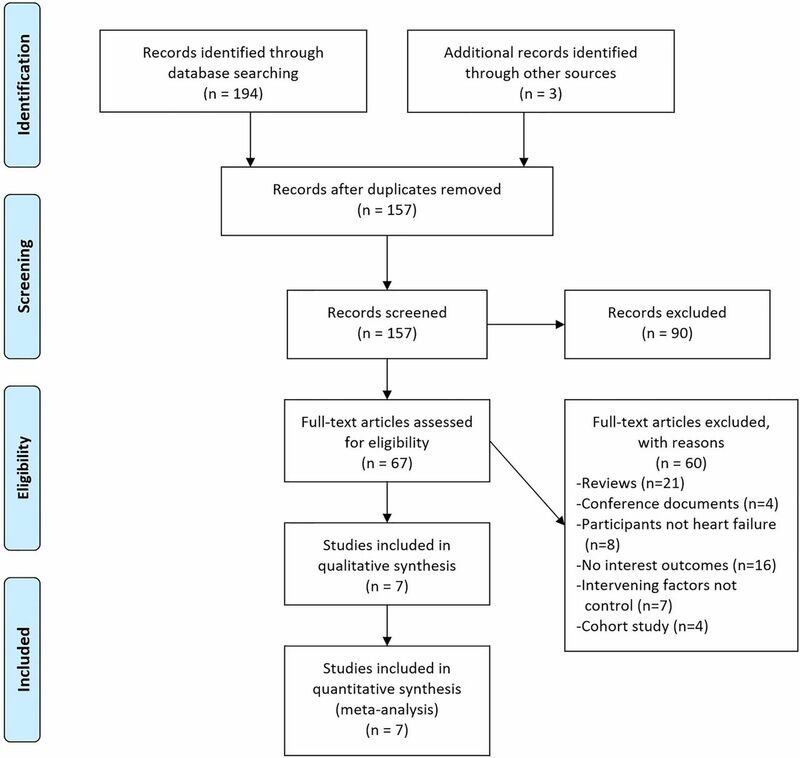 Since there are disputes among different study results, we conducted a meta-analysis of relevant RCT studies to further clarify the influence of vitamin D supplementation on ventricular remodelling in patients with HF. Results of this study show that supplementation of vitamin D inhibits myocardial remodelling and improves cardiac function in patients with HF. Different studies have different results and conclusions, which may be attributed to the different recommended dosages of vitamin D; since there is no standard recommended dosage of vitamin D at present, there are differences in the recommended dosage of vitamin D in different trials, which may affect the study results. However, there has not been a report related to adverse effects from the dosage of vitamin D. Meanwhile, the study results are related to the selected group; for example, the study results of Schleithoff et al 28 showed that there were no remarkable changes in the LVEF and LVEDD, and the participants included in this study were predominantly those with NYHA level 3–4 and a high degree of HF, and there was a high rate of lost to follow-up visit (37%). The data on changes in the LVEDD showed high levels of heterogeneity among studies. Shedeed29 studied the cause of heterogeneity according to subgroup. There was a difference in the metabolism of vitamin D and cardiac recovery capacity between newborns and adults, which might be the cause of heterogeneity. Although all trials included in this study are RCTs, there are still many limitations in this study (1) because the current studies found that vitamin D has a weak and uncertain effect on ventricular remodelling and cardiac function in patients with HF and cannot improve exercise tolerance or reduce cardiac mortality, additional large-scale clinical studies are needed. Future research needs to focus on whether different vitamin D dosages would be superior; in addition, different selection criteria need to be defined (eg, ejection fraction, vitamin D threshold, PTH threshold, etc) and additional echocardiographic parameters, the 6MWD and cardiovascular mortality need to be evaluated; (2) this study exhibits heterogeneity, and age stratification and whether there is reduced ejection fraction may be sources of clinical heterogeneity according to the subgroup analysis; (3) different recommended dosages of vitamin D are reported in different trials, which may affect study results; therefore, additional trials are required to explore the relationship between vitamin D dosage and effect; (4) the conclusions need to be interpreted with caution as the extent of detected improvement in the remodelling parameters is close to the range of the inter-observer or intra-observer variability of the echocardiographic method itself. The baseline vitamin D level of patients and the follow-up duration may affect the study results, and except for Dalbeni et al,27 who have mentioned that no change in therapy was made during follow-up, other studies have not reported adjustments in HF medication. Therefore, whether the weak improvement in the remodelling parameters from vitamin D are attributed to other HF drugs is unclear. In conclusion, this study shows that supplementation of vitamin D inhibits myocardial remodelling in patients with HF and improves their cardiac function. Vitamin D may be used as adjunctive HF medication for patients with HF with an underlying lack of or insufficiency in vitamin D. This result is encouraging and of great clinical interest but still far from practical implications. The main implication is to encourage further research.
. Is vitamin D deficiency associated with heart failure? A review of current evidence. J Cardiovasc Pharmacol Ther 2011;16: 354:e63. , Cochrane Handbook for Systematic Reviews of Interventions Version 5.1.0, 2011. www.cochrane-hand-book.org (updated Mar 2011).
. The C linical Effect of V itam in D 3 Supplem entation on C ardiac Function in Patients w ith Ischem ic H eart Failure. Chinese and Foreign M edical R esearch 2015;13:3–5. Institute of Medicine. Dietary Reference Intakes: Calcium and Vitamin D. Washington, DC: National Academies Press, 2011.
. Parathyroid hormone and left ventricular hypertrophy. Eur Heart J 2003;24:e60.
. The effect of vitamin D supplementation in vitamin D deficient men with heart failure. A randomized controlled trial.:P1686. European journal of heart failure 2014;16:335.
. Vitamin D supplementation improves the size and function of the left ventricle in patients with heart failure. Eur Heart J 2015;36:665. Contributors J-DZ: Makes a significant contribution to the concept or design of the work; or the acquisition, analysis or interpretation of work data; drafting work or critically modifying important knowledge content; final approval of the released version; and agreeing to all work Responsible for ensuring proper investigation and resolution of issues related to the accuracy or completeness of any part of the work. JJ J: Participate in writing. P-SD: Serving as a scientific consultant. DZ: Participated in the technical editing of the manuscript. X-MY: Critically reviewed the research proposal. D-LL: Data collected. H-FZ: Data collected. Ethics approval The study was conducted in accordance with the Helsinki Declaration and approved by the Ethics Committee of Henan University of Science and Technology. Data sharing statement The authors declare that they are willing to share their data directly.